We offer conservation framing, experienced design, art consulting, rush service, delivery, and installation. (click for more). Larson Juhl is the largest distributor of picture frame moulding in the world. Larson Juhl Moulding is available in length moulding or custom made frames. We ship any Larson Juhl custom frame nation wide. Roma Moulding offers high-end hand finished Italian moulding. Roma Moulding is also available in length moulding or custom frames, nation wide shipping. 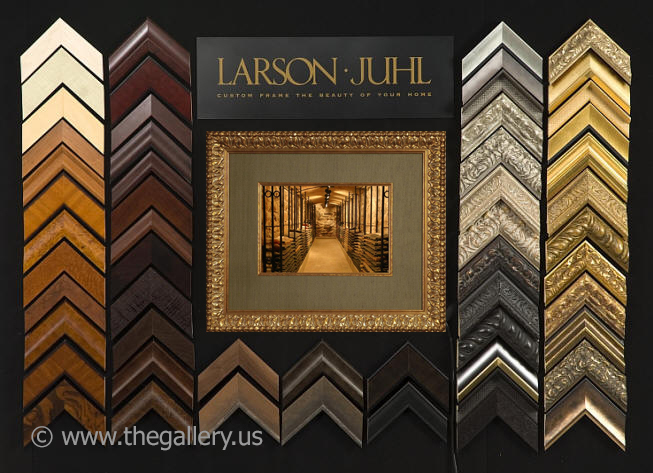 Larson-Juhl's broad range of quality custom framing products provide design solutions to suit nearly anything you can have framed. The diversity of our frame designs also coordinate with all of the popular interior design styles and individual personal styles. Preserve your memories of weddings, parties, or any other special occasion with this metal guest book mat. All you need is a photograph and your guests can permanently etch their signatures onto the superior quality alloy mat. We quote any Larson Juhl or Roma Moulding custom made frame online. Monthly specials with discounts upto 40% or more.